Protecting grain quality and ultimately the economic value of the grain begins long before the first acre is ever harvested. This pre-harvest activity is to prepare grain harvesting, handling and storage equipment and structures for the soon to be harvested corn and soybeans. All pieces of equipment used in harvesting the grain should be cleaned, inspected, and repaired several weeks prior to the beginning of the harvest season. Like in real estate where the mantra is Location! Location! Location!, the mantra in grain harvesting and handling should be Sanitation! Sanitation! Sanitation! Starting with thorough cleaning of every piece of equipment through which or in which grain will be passed or hauled. Remove all traces of old grain from combines, combine heads, truck beds, grain carts, augers, lift buckets, grain pits, grain driers, bins and any other equipment used for harvesting, transporting, and handling grain. Even small amounts of moldy and/or insect-infested grain left in equipment can contaminate a bin of new grain. Since grain is usually in contact with grain bins for the greatest length of time, extra attention should be paid to the sanitation of these structures. Remove any grain or grain dust from inside the bins by sweeping or vacuuming empty bins and brushing down walls. Pay close attention to cracks and crevices, ledges over doors, and hollow tube ladder rungs on or in which grain could have been trapped from the previous storage seasons. Fans, aeration ducts, exhausts, and when possible, beneath slotted floors should be cleared of debris as well. Dispose of all debris in a lawful manner and away from the storage facility. Sanitation outside of bins is as important as inside of the bins. Ideally there should be no vegetation (weeds, shrubs, etc.) growing up against the outside of the bin. Grain pests (insects and rodents) can be harbored in the vegetation. Bare ground covered with gravel or cement is preferred, but short-mown grass is tolerable. Remove any spilled grain from around the outside of the bin and storage facility. 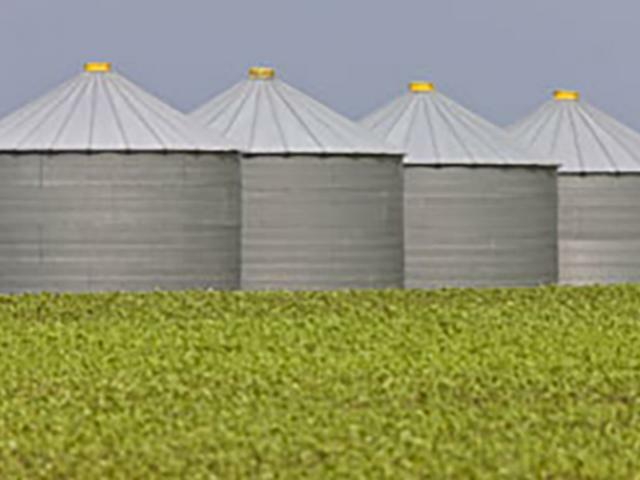 Once storage structures have been thoroughly cleaned, carefully inspect them for signs of deterioration, especially for leaks and holes through which insects, birds or rodents can gain easy access to the stored grain or rain and snow can drip or blow in onto the grain to produce wet spots that can lead to mold growth. While inspecting for physical problems, one should also test aeration fans and driers for functionality. Check belts, bearings and gear boxes for wear and proper lubrication. Check electrical systems for corroded connections and frayed wiring before harvest. Mice like to nest inside electrical boxes where they are safe from predators. They will strip insulation from wires for nesting material and their urine causes corrosion. While inspecting control boxes, be sure to seal any openings through which mice could get in. Be sure that guards and safety shields are in place over belts, chains and intakes. Seal all leaks and make repairs to the equipment before you need them to manage the grain. Once all cleaning and repairs have been completed, an empty-bin application of an appropriately labeled insecticide is advisable, especially in bins with difficult to clean areas and/or in bins with a history of insect problems. For empty-bin insecticide treatments that are applied as a liquid, allow a minimum of 24 hours for the sprays to dry before loading grain into the bin. It is preferable to have empty-bin treatments applied at least two weeks prior to harvest. Registered empty-bin insecticides include: Tempo SC Ultra (cyfluthrin), Storcide II (chlorpyrifos-methyl plus deltamethrin) which is primarily used around small grains such as wheat, Centynal or Suspend SC (deltamethrin), Diacon-D IGR (s-methoprene = an insect growth regulator), and several pyrethrin products can be used to apply a surface treatment to the inside of the bin and provide a residual protection. Other products that contain diatomaceous earth and/or silicon dioxide such as Insecto, Protect-It, Perma-Guard and others may be utilized. Refer to the individual product labels for lists of insects controlled and application directions. Note: most if not all malathion products have removed stored grain uses from their labels. If a bin is known to be heavily infested with insects, an empty-bin fumigation may be required to knock down insect populations before applying one of the above insecticides. The most readily available product for this purpose is phosphine gas producing materials such as aluminum phosphide and magnesium phosphide sold under a wide variety of trade names. Phosphine is an extremely toxic material and fumigations should be conducted by trained, experienced, licensed applicators. Another measure one might take to reduce the chance of insect infestation is to apply a perimeter spray around the base and up the outside walls of the bin about 15 feet. This may only be necessary in areas where grain infesting insect movement has been observed on the outsides of the storage bins. There are several synthetic pyrethroids (cyfluthrin, deltamethrin, permethrin, resmethrin, etc.) that can be used for this purpose as long as they do not come in contact with the grain. Grain storage insecticide labels tend to change frequently. As always, check to make sure you are following the instructions on the product label and using the appropriate product for your situation. One also needs to be sure that the end-user of the stored grain does not have restrictions on insecticide uses on or around the grains that they are going to purchase. If growing specialty grains, check with your buyers before using insecticides. A few more words of caution include, new grain should NEVER be stored on top of grain from a previous season's harvest; remove old grain and clean bins before adding new grain. Grains broken in the harvesting and/or handling process become more susceptible to infestation by insects and mold. Thus, adjust combines according to the manufacturer's specifications to minimize grain damage and to maximize removal of fines and other foreign material, move grains as little as possible, and limit the number of times and heights from which grains are dropped to reduce breakage. Last but not least, review your safety procedures for working with flowing grain, grain harvesting and handling equipment, and personal protection. Anyone who works around the bins and grain handling equipment should know where to find shut-off switches, fire extinguishers, and emergency phone numbers. Being prepared for harvest will reduce the risk of accidents, and knowing how to react in an emergency can save lives.